Pork Afritada Recipe – Eats Yummy! My mom recently cooked Pork Afritada few days ago and we would like to share the recipe. 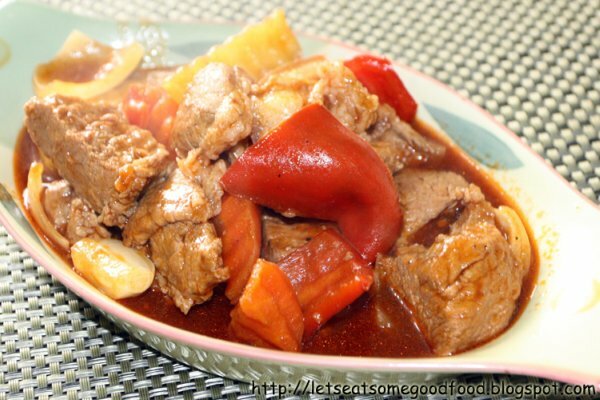 This easy recipe and good food dish is also known as Stewed Pork In Tomato Sauce. This Pork Afritada recipe is very similar to Menudo, Mechado or Caldereta since they are all tomato based. Afritadang Baboy as we call it locally has a unique taste compared to similar tomato based Filipino recipes. Also, you could differentiate it from the others for its cut of pork, other ingredients. In a bowl, season pork with salt and pepper. Let stand 10 minutes. Heat oil in a saucepan over medium heat. Stir-fry the pork pieces until lightly brown. And then add the garlic and saute until fragrant. Add onions until soft and translucent. And then add carrots and season with patis and stir-fry for a few minutes. Add the potatoes and stir-fry for another minute or two. Pour in water and tomato sauce and bring to a boil. Lower the heat and simmer covered for about 15 to 20 minutes or until pork is cooked and the carrots and potatoes are tender. Add bell peppers and stir to blend. Add cornstarch to thicken the sauce. When the sauce gets thick, stir to blend and let simmer for few minutes. Serve hot in a serving bowl. Best paired with steamed white rice. Share your thoughts about this recipe. Please write your comments below.